Why I read it: As a Marshmallow I couldn't resist! 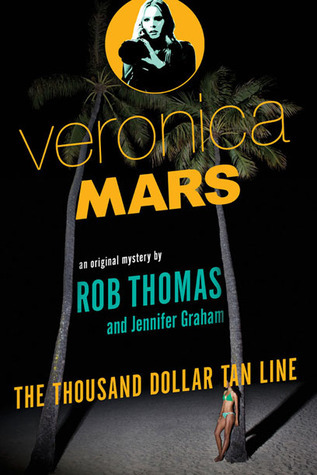 “Ten years after graduating from high school in Neptune, California, Veronica Mars is back in the land of sun, sand, crime, and corruption. She's traded in her law degree for her old private investigating license, struggling to keep Mars Investigations afloat on the scant cash earned by catching cheating spouses until she can score her first big case. As a proud Marshmallow, I eagerly downloaded the audio book for this, especially after I learned that it was narrated by VMars herself, Kristen Bell. It was everything I could have hoped for! (Well, minus ONE thing. I could have used a bit more of a certain character… ;) ) It has the sass, the mystery, the genius, the laughter and tension of the TV series and movie. It was so fun to be back with these characters! Every time a familiar character entered the scene it was like a reunion for me. Old favorites back together again. All of the references and inside jokes! It kept me on my toes and challenged my Veronica Mars trivia! I was weirdly pleased every time I made the connection and remembered the right facts and details. The mystery itself kept me guessing throughout the story. I’d start to suspect someone, then change my mind. Then I’d start wavering again. The “who done it” was pretty surprising, and I was so pleased that I was actually surprised, that doesn’t happen all that often! I did guess a few of the twists. Overall, it was a great story. Made even better by Kristen Bell’s narration. If you haven’t watched the series, you’d probably be very very lost. I also recommend the audio over print. I’ve been told that the style of writing is a bit too script-like, which makes for a great audio book. Now... Where are my fellow Marshmallows??? Loved this! I'm planning to read the next instalment, Mr. Kiss and Tell. OMG I did the same thing when I found out it was a real thing and OMG yes the audiobook by VM! I listened to it on a road trip and it flew through. I also agree that it had a little less of a certain character I love ;) Down side is it ruined me for anyone else narrating the future books! I just finished reading this! Loved it too. How did I miss that it was narrated by Kristen Bell???? Must listen! The story can only get better hearing it in her voice! And yes, Logan totally needs to go on leave so we can see him more in the books, him being deployed is no good. especially because Kristin does the narration!! This most definitely has my attention I loved that they carried on with the story!!! Oh! I still miss Veronica Mars. May have to try listening to this during my next long drive! I know the feeling you've described. Being an X-files fangirl, I get the same feeling while watching the trailer for the revival. It's something special when your favorite franchise is being brought back to life.